Notation for the silent drum is graphical. From the perspective of the camera the drum has a maximum diameter from left to right. This diameter is expanded in time. Drum events are organised in time through their discrete parameters. Every peak has at least an attack, a change in direction and a release. Each peak is drawn as a shape that extends in time. The intensity of the peak, how deep down the head is pressed is notated by the width of the polygon. Peaks can be primary or secondary. The primary peak is just the one that is pressed deeper; the rest are secondary and there can be as many as physically possible. If a secondary peak were to become the primary one, it should be noted specifically. Durations and tempo can be added for more precise notation. Reference can be made to how the electronics will behave or how they will actually sound, through musical notation or graphs. 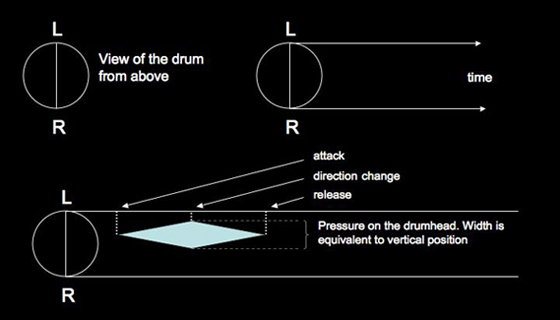 Drum attacks and other discrete events can be counted to control an electronic score.